The flowers of various Citrus species are the source of the famous neroli oils used in fine perfumery, particularly in Colognes. One example is the flowers of the bitter orange, mainly cultured in North Africa. 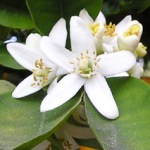 Neroli oil is obtained by careful steam distillation of the freshly picked flowers in about 0.1 % yield. An even more valuable material is the so-called orange flower absolute, obtained by extraction (see boronia for details on absolutes). In both products, linalool is the main volatile constituent. Nerolidol and farnesol are characteristic ingredients. Moreover, a number of N-containing constituents are odour-determining, e.g. methyl anthranilate, indole, phenylacetonitrile and 1-nitro-2-phenylethane  . Etymology: It. neroli, from the French-born Anna Maria de la Trémoille (1670-1722), princess of Nerola, a village near Rome. She loved the fragrance of the orange flowers, and was the first person to have them distilled. The tertiary sesquiterpene alcohol 3,7,11-trimethyl-1,6,10-dodecatriene-3-ol was first identified in neroli oil, whence the name nerolidol. Somewhat later, the isomeric alcohol 3,7,11-trimethyl-2,6,10-dodecatriene-1-ol was also identified. It was correspondingly named farnesol, from Villa Farnese, another village near Rome. Eau de Colognes have been created since the end of the 17'th century. The classical ingredients were neroli oil, bergamot oil, orange oil, lavender oil and rosemary oil. Colognes are still going strong, a modern example is Baldessarini (Hugo Boss 2002). 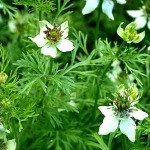 The name Nigella, derived from Latin niger, means something like 'small black ones'. Carl von Linné thereby wanted to draw attention to the black seeds of this genus. N. sativa is an annual herb native of southwest Asia. 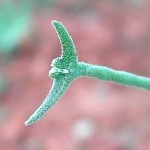 The seeds have been used for centuries as a medicine and as a spice . An Arab proverb calls them "the medicine for every disease except death." 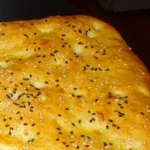 The variety of naan bread called Peshawari naan is usually topped with nigella seeds. The seeds contains an essential oil of thyme-oregano-like aroma. A recent Algerian study found the main constituents to be p-cymene, thymol, thymohydroquinone, carvone, thymoquinone, carvacrol, and 1-terpinen-4-ol, together representing more than 36 % of the oil . Moreover, the compound damascenin, or methyl 3-methoxy-2-methylaminobenzoate, an odoriferous 'alkaloid' characteristic of several nigellas, is present . There are about fifty species of the Cruciferan genus Matthiola, having their main distribution from the Canary Islands, the Mediterranean area, and into Central Asia. 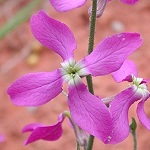 Matthiola longipetala or Night-scented Stock is grown as an ornamental primarily for its evening scent. It is a tenuous, low-growing and highly branched crucifer with light purple flowers appearing wilted during the day but awakening in the evening and then emitting a remarkably powerful scent - strongly sweet and with a spicy nuance. Hammami S et al. steam-distilled the fresh flowers of Tunisian-grown M. longipetala and analysed the obtained oil by GC and GC-MS. Major volatiles were (E)-2-octenal (2 %), nerolidol (2 %), bicyclogermacrene (14 %), and eugenol (20 %) . Etymology: Matthiola, from the Italian doctor and naturalist Pietro Andrea Gregorio Mattioli (1501-1577), Lat. longipetala, with long petals, Lat. bicornis, with two horns, i.e. the shape of the fruit. 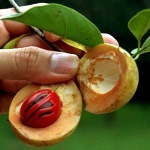 The nutmeg tree probably originates in New-Guinea. The fruit resembles a smooth peach. When it ripens, it cleaves, and the purple-brown seed with its lobed, coral-red coat becomes visible. 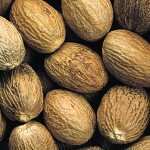 The nutmeg as we know it is the shelled kernel. Its use as a spice is due to an aromatic oil consisting of approximately 90 % terpenes, with sabinene, alpha- and beta-pinene, and 1-terpinen-4-ol as major components. However, a number of phenol ethers play a decisive role for the overall fragrance, three of them are shown . Terpeneless nutmeg oil is sometimes used in masculine perfumes. An elegant example is Cacharel Pour L’Homme (Cacharel 1981). Etymology: Gr. myristikos, fragrant, Lat. fragrans, fragrant. Nutmeg is rich in the fatty acid tetradecanoic acid, also called myristic acid. Oakmoss adds to the smell of the forest with its dry fungoid earthy-woody odour. In spite of its name, oakmoss is not a moss but a lichen, growing on the bark of deciduous and coniferous trees. 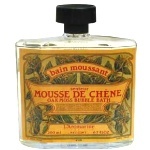 It was used in perfumery as early as the 16'th century. Baskets filled with it have been found in the ancient royal tombs of Egypt, but whether it was intended for perfume is not known. 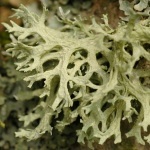 A mixture of phenolic acids extracted from oakmoss has been used in drugs for treating external wounds and infections. In modern time oakmoss has been collected in France, Morocco and Yugoslavia and extracted for perfumery purposes ('Mousse de Chêne'), but today some of the most important odour-active ingredients are made synthetically. Oakmoss has the special odour notes associated with the warmth of the fireplace, walnuts, the smoke from birch wood, etc. The key odorants are the phenolic compounds shown above . Oakmoss is used in countless perfumes of the fougère and chypre types. For instance, it is evidently present in the dry-out notes of the marvellous Kouros (Yves Saint Laurent 1981). P.S. The compound methyl 2,4-dihydroxy-3,6-dimethylbenzoate can be synthesized in an interesting process from acyclic precursors (methyl crotonate and methyl 3-oxopentanoate, see animation!). It has an extremely penetrating odour, maybe owing to quinoid tautomerism. P.P.S. For a true moss scent - see Liverwort. Like myrrh and opopanax, olibanum is a gum-resin from small trees and thorny bushes of the Burseracean family. They are growing in the northern Somali republic and in southern Arabia. Olibanum is one of the oldest aromatic materials used by mankind. Already in the Antiquity it was used as an incense in Mesopotamia, Egypt, Greek and Rome. Ovid speaks of the solidified olibanum droplets as 'tears'. 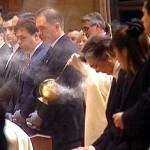 The catholic church adopted the use of incense burning in the 5'th century. 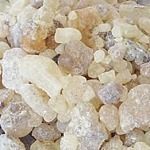 A number of closely related Boswellia species exist. 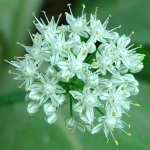 Several publications deal with analysis of the volatiles from olibanum, but the samples were often purchased from markets and so lacked a certified botanical origin. A recent study on a certified olibanum sample from B. carterii identified alpha-pinene, beta-myrcene and limonene as the major monoterpenes. Beta-caryophyllene, alpha-copaene, alpha-humulene and caryophyllene oxide were the major sesquiterpenes. The characteristic olibanum compounds isoincensol and isoincensyl acetate together with cembrene A were the main diterpenes. Octyl acetate is a characteristic of B. papyrifera, but it was not found in B. carterii . The smell of olibanum smoke is influenced by a multitude of pyrolysis products from the terpenoids present in the resin. Commercial olibanum oil obtained by steam distillation of the resin from mixed Boswellia species has a sweet, woody-balsamic odour with a fresh, almost citrusy nuance. 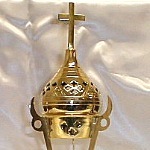 It is used in luxury perfumes, e.g. Opium (Yves Saint Laurent 1977). Europe and North America. 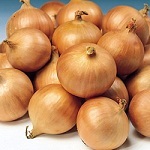 The ancestor of onion grows wild in Iran. Onion has been cultured for more than 6000 years. 1-22 micromol/ml thiopropanal S-oxide . 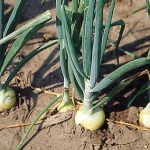 This volatile chemical is water soluble, and exposure from it may be minimized by rinsing away the onion sap with water. Etymology: The name Allium was used by the Romans for garlic, Allium sativum. Lat. caepe, onion.